We obtained 18F-deoxyglucose (FDG) positron emission tomography scans and CT scans of the upper thorax in nine insulin-resistant adults and two overweight healthy volunteers to assess quantitative glucose metabolic rate of brown and white fat. Scans were obtained following 90 min of exposure to cold (67–68 °F) and warm(72–73°) air temperature. FDG scans were converted to micromoles glucose/100 g/min using PMOD Technologies, Zurich, Switzerland, and the arterial input function from the aorta image. The initial high-resolution 200MA CT was used to coregister both PET and CT images. CT masks of 7 Hounsfield unit bands, −600 to −160 (mainly lung), −160 to −120, −120 to −80, −80 to −40, −40 to 0, 0 to 100 (muscle), and 100 to 600 (bone and some muscle), were computed. Cold minus warm metabolic rate images were obtained, and the greatest cold minus warm effect was found in the fat range with Hounsfield levels from −160 to −60 units, consistent with earlier studies of brown fat. This was confirmed with three-way ANOVA with repeated measures (cold/warm × Hounsfield unit band × thorax level). This algorithmic method avoids bias associated with visual tracing of fat types. Leg muscle tissue FDG and CT were obtained on eight of the subjects and showed leg muscle metabolism higher during the warm than cold conditions. This study demonstrates that brown > white fat regions of the upper thorax demonstrate thermal sensitivity and that FDG-PET/CT can provide a potentially useful measure of the pharmacological effects of brown fat enhancing action of new treatments. 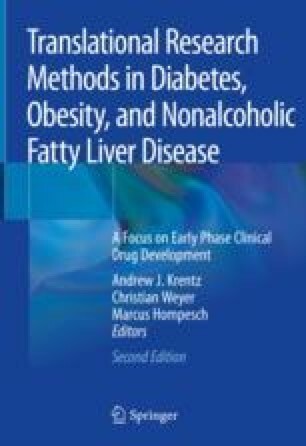 The authors thank Andrew Krentz, Linda Morrow, and Marcus Hompesch for their support and useful advice at varied stages of the preparation of this chapter. Gisela Peterson and Laurel Glockler provided careful data organization support. George Madirossian provided assistance with scanner calibration and phantoms, Tim Erickson with electronic records, and Steven Hardy with file organization and scanner operation. Didier Laurent made useful suggestions for the data analysis.